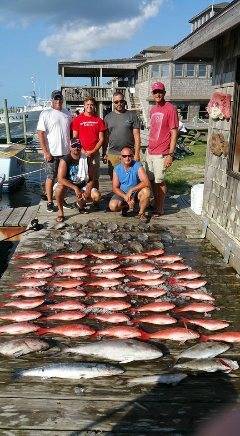 We catch a variety of snappers here but the majority of what we catch are Vermillion Snapper. We are allowed 5 per person. They are slightly smaller than genuine red snappers but taste just as good. The best snapper fishing is usually from mid june through september. 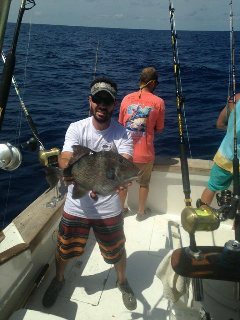 We catch trigger fish almost year round here in Hatteras. They are a great table fare even though they arent very pretty to look at. They are called poor mans lobster in many circles and if you have ever tried them you know why. They are also fun to catch as they put up a good fight on light tackle especially when catching 3 at a time. 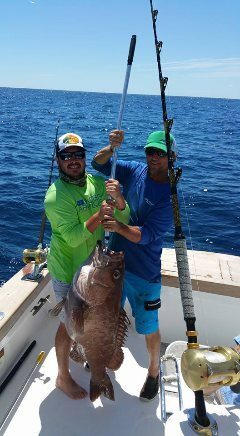 We catch a variety of Grouper here in Hatteras but the most abundant are the Snowy Grouper. We are only allowed 1 per vessel ut they are usually good size and yield some quality meat. They are one of if not the best eating fish in the ocean. They are usually in 75 to 150 Fathoms so if the current is running they can be difficult to catch.